Chiquita Brands enjoys impunity in spite of the fact it has been proved it has repeatedly remunerated paramilitary forces oppressing the local population. Chiquita Brands was initially the United Fruit Company, famous in Colombia for the massacre of workers in 1928 in Cienaga. Chiquita Brands International is now a leading international marketer and distributor of fresh food and related products. It is one of the largest banana distributors in the world and it has been operating in Colombia since last century. 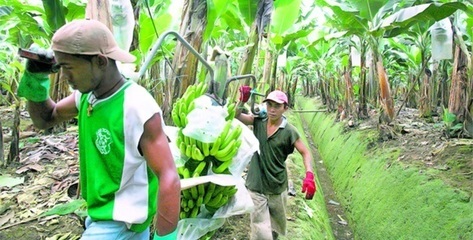 National and International labour, environmental and human rights protection advocates have denounced Chiquita Brands for its environmental, social and health impacts caused by the violation of the basic rights of banana plantations workers and the financing of paramilitary groups in order to suppress protest. Forjando Futuro is a foundation helping those dispossed. In 2012 it announced that there was an estimate of 19.5 USD million that Chiquita has paid paramilitary groups un Uraba but that the true figure acknowledged by the paramilitary themselves was 40 USD million. Among the paramilitary forces, the AUC, a terrorist group, was paid too by Chiquita Brands. There were several court cases opened in the United States and in Colombia against Chiquita Brands. In April 2015 the US Supreme Court concluded it is not under its jurisdiction to decide on the accusations against the American company for its activities in Colombia. The company remains unpunished by Colombian justice too while local NGOs still denounce the violence suffered by local population in behalf of Chiquita Brands. Development of Alternatives Indemnities for displacement by paramilitary groups paid for by Chuqita, workers also demand a decent salary. They are desperate about the stop of the use of pesticides in the cropping fields. They also want their land back, they don t want to continue being displaced. Why? Explain briefly. Although these violations have led to judicial activism, no relevant court decisions have been given yet in favor of the affected population.